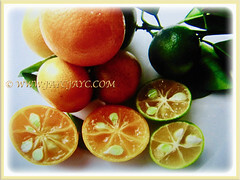 Calamondin Orange or Golden Lime is the most versatile citrus. It is highly prized for its ornamental value and its edible fruits. Botanical Name: Citrus mitis (syn. : Citrus microcarpa, Citrus madurensis). 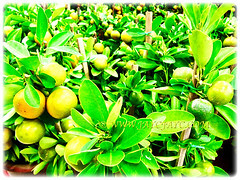 Common Names: Calamansi, Golden Lime, Panama Orange, Orange Calamondin, Chinese Orange, Musk/Acid Orange, Limau Kasturi in Malay. Etymology: The genus Citrus originate from Latin word Citron, referring to the smell of the citrus leaves. The specific epithet mitis means small fruit or to ripen/refresh. Origin: Native to China, Southeast Asia including Malaysia, Indonesia and Philippines. It widely cultivated elsewhere around the globe. 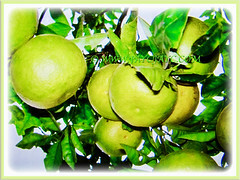 Features: Citrus mitis is from the genus, Citrus that consists of about 31 accepted species of plants. A fast-growing tree or shrub that can reach about 2-7.5 m tall. It is erect, slender and often quite cylindrical. It is densely branched beginning close to the ground, slightly thorny and develops extraordinary deep taproot. The sweetly scented flowers, having 5 elliptic-oblong and pure-white petals are about 2.5 cm wide and borne singly or in 2 or 3 terminally or in the leaf axils near the branch tips. The showy fruits are round or oblate and 4.5 cm wide with very aromatic, orange-red peel, glossy and dotted with numerous small oil glands. It is tender, thin, easily-removed, sweet, and edible. The pulp in 6-10 segments is orange, very juicy, highly acidic, seedless or with 1 to 5 small and obovoid seeds. The flowers are self-fertile and need no cross-pollination. 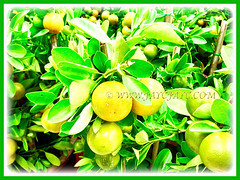 Culture (Care): Citrus mitis or Golden Lime can be easily grown with least maintenance. Light: Full sun. It tolerates semi-shade. Nonetheless, best flowering occurs in full sun. Moisture: Moderate water needs. Water regularly. Soil: Best in humus-enriched, loamy and well-drained soils. It does not tolerate continuous water soaked soils. Others: Pruning or harvesting the fruits regularly with encourage new growth and produce more fruits. Fertilise once monthly using one-half strength of water-soluble fertiliser. Generally free from serious pest and diseases. Nevertheless, do watch out for the Mediterranean/Caribbean fruit flies, aphids, spider mites, mealybugs, scale and citrus bark borers. Potential diseases include leaf mottling and citrus canker. 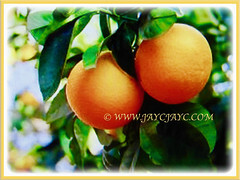 Citrus mitis or Calamansi will struggle with temperatures below 4.44°C. They are intolerant of frost. In zone 7, Citrus and even the most hardy citrus tree varieties do not tolerate temperatures below -12 to -18°C. Never plant Citrus where it will be struck by cold northern winds. 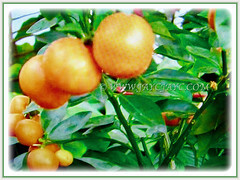 North of USDA Zone 10, Calamondin is best grown in a container which is overwintered indoors. Set containers outdoors in late spring in full sun in a location protected from wind. Bring containers indoors in fall for overwintering to a cool and bright sunny southern window. In winter, mist plants with water or use a humidifier as the plants love a humid environments. Potted plants are brought into a greenhouse, conservatory and indoors as a houseplant during the winter periods in regions with cooler climates. Fertilise sparingly during the winter months using one-half strength water-soluble fertiliser. Propagation: Easily propagated from seeds or rooted cuttings. 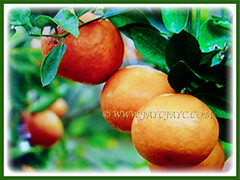 Usage: Citrus mitis or Calamansi with its edible fruits and ornamental beauty will be excellent when grown on the ground. Ideal too for container gardening. 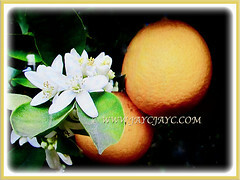 Suited to be grown as a hedge to feature its scented white flowers and small orange fruits. Fruit is very sour but has a large number of culinary uses including juice added to beverages, food flavoring, sauces, marmalades, pies, and soups. 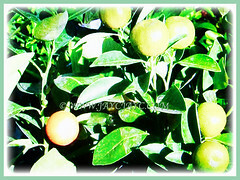 Calamondin fruits are sometimes sour and primarily used for cooking. In Asian cuisines, the juice is used to season fish, chicken and pork. Like other citrus fruits, the calamondin is high in Vitamin C. Its juice is used make gelatin salads, desserts, custard and chiffon pie. Calamondin has considerable amount of essential oils stored in the rind. 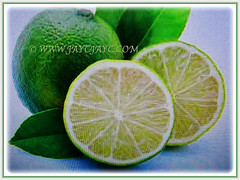 The calamansi essential oil is used to alleviate symptoms of depression and anxiety. It can be beneficial as an additive to cleaning products because of its ability to neutralize odors due to its high limonene content. The fruits may be crushed for shampooing the hair or the fruit juice applied to the scalp after shampooing as it eliminates itching and promotes hair growth. Rubbing calamondin juice on insect bites removes the itching and irritation. It is taken orally as a cough remedy, laxative and is anti-inflammatory. Combined with pepper, it is prescribed in Malaysia to expel phlegm.